The staff of the Pioneer Girl Project is about evenly divided between the two great classes of humanity. There are the morning people—upstanding folks who wouldn’t mind getting up early with Charles Ingalls to shovel snow off their families—and then there are those who would prefer to chat with the Boasts until the moon rises in the wee small hours. I am one of these latter types; it was with a dull eye that I piled into the car early on a Wednesday morning in May with project director Nancy Tystad Koupal (another like me) and Jennifer McIntyre (not one of us). Soon we were off toward the rising sun on a research pilgrimage to a certain little town on the prairie. As we traveled along U.S. Highway 14, we stayed generally in sight of the old Chicago & North Western Railway line, which raced across Dakota Territory to the Missouri River in 1879–1880. Charles Ingalls moved west with the railroad, taking a bookkeeping job for a contractor working on this very line. First, we wanted to look at records pertaining to a murder in the Bouchie family. Second, and more importantly, we wanted to look at various records to see what light they might shed on Laura’s school days as both student and teacher. And if we had any time left over, perhaps we could twist some hay. I was fully awake by the time we arrived at De Smet’s high school, where we pored over old school-board minutes. They didn’t extend as far back as we had hoped, and we broke for lunch without having achieved much. 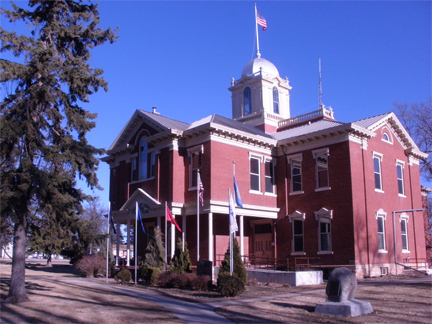 We reconvened at the Kingsbury County Courthouse, a lovely Italianate-influenced structure built in two segments (1889 and 1898) for a fast-growing county. Charles Ingalls worked there at times in various roles, such as justice of the peace and bailiff of the court. Here we hoped to find the records of the county superintendent of schools. Our first stop was the auditor’s office, and from there we were led down to “the vault,” a room I can only describe as the perfect place to read “The Cask of Amontillado” by flashlight. Rusty, musty, and cramped, this is where records go when they are too old to be of any practical use to a county, and there are a lot of them. The room was lined—up, down, and across the middle—with shelves full of often dank and discolored tomes. And in this haystack, we had to find the pin. Never mind; it was game time. Off with the jackets, on with the dust masks, and in we went to divide and conquer. There it was! It had fallen behind a row of completely unrelated record books. We recognized our luck in finding a source were it ought never to have been, but we still had no idea if it would tell us what we wanted to know. Nevertheless, with a jaunty step we took the book into the hallway, donned our cotton gloves, and with Nancy reading the text, Jenny taking notes, and me standing by with a camera, we dived in. I am happy to say that it went a long way to answering many of our questions. We took the book back up to the auditor’s office (“This is a treasure—don’t lose it!”), then continued up the stairs to the clerk of courts, where we were ensconced in the judge’s chambers with the documents we needed. I wonder what one of the Bouchie women would have written to explain her family’s troubles. Readers will remember Oliv Bouchie as Mrs. Brewster, the woman who got a little too expressive with a butcher knife in the claim shanty where Wilder spent a miserable winter while teaching her first school. But it was not this Bouchie who ended up on trial in 1887 for manslaughter; instead, Oliv’s stepmother-in-law, the mother of Wilder’s students, was one of the defendants. Wilder does not mention this incident, but the records of the case, including the depositions of witnesses, paint a picture of a strange and tense family. We spent another hour lost in this troubling tale. As the courthouse closed for the day, we stopped for a brief visit behind the scenes at the Laura Ingalls Wilder Memorial Society to scan some archival images. We did not make any hay twists—but we did photograph one. And then it was back to Highway 14 and home, a full day of digging behind us and another step closer to the publication of Pioneer Girl: The Annotated Autobiography. This entry was posted in Behind the Scenes and tagged Bouchie, De Smet, research by SDHSPress. Bookmark the permalink. Poor Mrs Brewster/Bouchie. I think living on the prairie would make me pretty high-strung too. Very interesting indeed! I agree with Dee. Can’t wait to read what you found out. And thank you all for your persistence and hard work on this project. That’s so exciting! I do hope you’ll share what you found about the Bouchie murder. I, too, have been in the dusty-musty vault and am delighted you found the school district minutes (or whatever it was!). Digging for treasures like that make the mining and learning so fun and satisfying, saying “A-ha! There it is!” Can hardly wait for PG’s release! Thank you for keeping us posted with interesting things you’ve found out. I feel apart of the excitment and intrigue. Can’t wait for another story of your findings. To those wondering about our specific findings: of course, we tease on purpose. You will find all this and more in Pioneer Girl: The Annotated Autobiography! You can now preorder on this site (under the “About” tab). Meanwhile, if you don’t mind teasing, stay tuned for more entries about the workings of the Pioneer Girl Project as we move toward the book’s release.